The Defibtech Lifeline AUTO AED has been cleared for sale in the US by the Food and Drug Administration and is now available at heartsmart.com. The Lifeline AUTO AED is a fully automatic defibrillator that is easy to use, has an award-winning design, and uses advanced technology to analyze a victim of cardiac arrest. The Lifeline AUTO AED features and technology makes it possible for basically anyone to save a life. When someone is experiencing cardiac arrest someone may want to help, but be hesitant due to fear of causing more harm to the victim. The Lifeline AUTO AED features and technology makes it possible for virtually anyone to save a life. It can assess the heart and automatically administer a shock without any intervention, making it easy for any rescuer to help in an emergency situation. The user is coached through the process with step-by-step instructions from a clear calm voice that describes how to apply the defibrillator pads and when to administer CPR. The award-winning design provides a compact, portable, lightweight AED that is durable enough to withstand dust, water and other extreme environments. It has been tested to withstand shock and vibrations by the military. 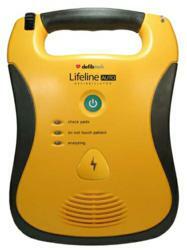 The Lifeline AUTO AED features a roomy handle and rubberized surfaces for added durability. The Lifeline AUTO AED was developed by engineering teams experienced in several disciplines to incorporate state-of-the-art digital signal processing techniques and advanced ECG analysis algorithms. The device exceeds American Heart Association performance recommendations and uses biphasic technology, a clinically proven waveform and algorithm to deliver shocks and save lives. Heart Smart leads the way in providing reliable AED devices and accessories for a variety of applications. Our mission is to serve individuals, schools, churches, companies, medical professionals, veterans, law enforcement officers and other groups interested in new, used or refurbished AEDs at affordable prices.